Histone acetylation is an important epigenetic modification that regulates gene activity in response to stress. Histone acetylation levels are reversibly regulated by histone acetyltransferases (HATs) and histone deacetylases (HDACs). The imperative roles of HDACs in gene transcription, transcriptional regulation, growth and responses to stressful environment have been widely investigated in Arabidopsis. However, data regarding HDACs in kenaf crop has not been disclosed yet. In this study, six HDACs genes (HcHDA2, HcHDA6, HcHDA8, HcHDA9, HcHDA19, and HcSRT2) were isolated and characterized. Phylogenetic tree revealed that these HcHDACs shared high degree of sequence homology with those of Gossypium arboreum. 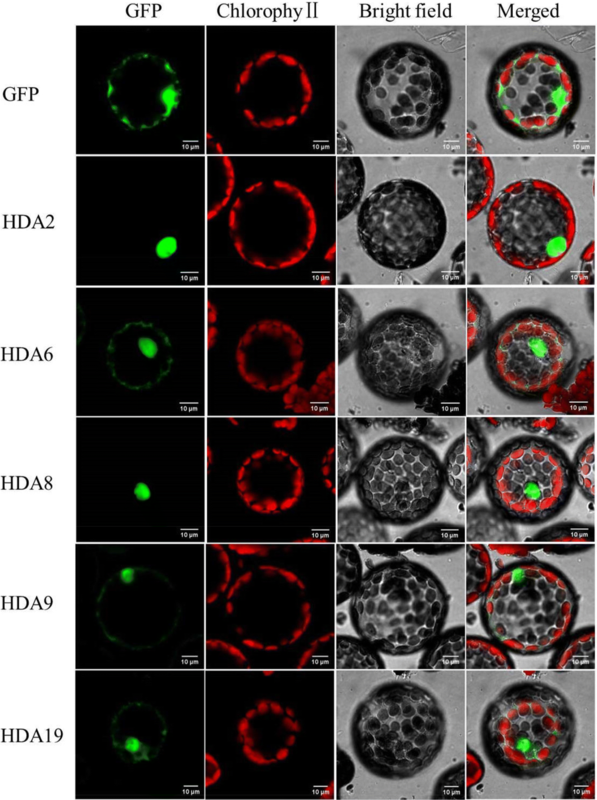 Subcellular localization analysis showed that GFP-tagged HcHDA2 and HcHDA8 were predominantly localized in the nucleus, HcHDA6 and HcHDA19 in nucleus and cytosol. The HcHDA9 was found in both nucleus and plasma membranes. Real-time quantitative PCR showed that the six HcHDACs genes were expressed with distinct expression patterns across plant tissues. Furthermore, we determined differential accumulation of HcHDACs transcripts under salt and drought treatments, indicating that these enzymes may participate in the biological process under stress in kenaf. Finally, we showed that the levels of histone H3 and H4 acetylation were modulated by salt and drought stress in kenaf. We have isolated and characterized six HDACs genes from kenaf. These data showed that HDACs are imperative players for growth and development as well abiotic stress responses in kenaf. Kenaf (Hibiscus cannabinus L.) is a herbaceous non-woody fiber plant which grows mainly in Asia and Africa. The bast fiber composed of 75% cellulose and 7% lignin and offer the advantage of being biodegradable. It has versatile applications such as in paper making, animal bedding, construction, carpet backing, cordage, livestock foraging and biomass crop [1, 2]. Furthermore, kenaf shows high tolerance to saline, alkaline, or arid condition, so it can be used for phytoremediation of saline-alkali soil, or as a drought tolerant crop. However, the mechanism of its tolerance is still unclear. The basic unit of chromatin is a nucleosome which contains a histone octamer formed with two copies of histone H2A, H2B, H3 and H4. Each histone comprises of a globular domain structure and an unstructured amino-terminal tail extending from the core nucleosome [3, 4]. The N-terminal tail of histone protein can provide sites for diverse post-translational modifications (PTMs), such as acetylation, glycosylation, methylation, ubiquitination, phosphorylation and ADP-ribosylation. Histone acetylation is one of the well-characterized PTMs [5, 6] and an important epigenetic modification that regulates gene activity in response to stress. Acetylation state of the ε-amino group of conserved lysine residues within all four core histones was reversibly regulated by the activities of histone acetyltransferases (HATs) and histone deacetylases (HDACs) [7, 8]. In short, HDACs acted in concert with HATs to regulate dynamic and reversible histone acetylation, which modified chromatin structure and function thus affected gene transcription resulting in the regulation of multiple cellular processes including stress response. HDACs were sorted into different families and were generally conserved in fungi and eukaryotes, including yeast, animals and higher plants. Plant HDACs were categorized into three families, RDP3/HDA1 and SIR2 families, which were homologous to HDACs found in yeast and animals, and HD2 family, which was unique to plants . Many plants HDACs have been cloned and identified as transcriptional activators or repressors in various biological processes [9–20]. In Arabidopsis, AtHDACs play important roles in seed development, germination, seed dormancy, circadian regulation, hypocotyls growth, female gametophyte development, embryogenesis, root hair development, leaf morphogenesis, flower development, responses to day length, environmental stresses and defensive response against pathogen attack [21–29]. Although HDACs are thought to play imperative roles in plant growth, developmental processes, and responses to stressful conditions, little is known about the biological functions of HDAC genes in kenaf. In this study, we identified and analyzed the characteristics of six HDAC coding genes, including HcHDA2, HcHDA6, HcHDA8, HcHDA9, HcHDA19 and HcSRT2 from kenaf. Subcellular location of HcHDACs was confirmed by GFP-tagged transient expression assays with tobacco protoplasts. In addition, tissue-specific and stress-responsive expression patterns of the six HcHDAC genes were evaluated by qRT-PCR analysis. Furthermore, the histone H3 and H4 acetylation levels of kenaf roots were analyzed under salt and drought treatments. These data will provide the foundation for further research on the function of HcHDACs in growth, development, and responses to abiotic stress of kenaf. The plant materials were grown at Guangxi University experimental farm (located at 108°22′E, 22°48′N). Seeds of kenaf cultivar P3B were raised on loamy soil with pH = 6.9 under natural conditions. Roots, stems and leaves were sampled at 7-day-old seedling and anthesis stages, and anthers were collected at tetrad, mononuclear, and dual-core stages for cloning and expression pattern analysis. Fresh samples were immediately frozen in liquid nitrogen and stored at − 80 °C for further analysis. For the stress treatments, 7-day-old seedlings were transplanted to hydroponic culture and exposed to different salt (0, 100, and 200 mM NaCl) and drought (0%, 10, and 20% PEG6000) stress levels. The culture condition was configured at light/dark cycle of 14/10 h at 28 °C with 60% relative humidity. After exposure to these stresses for 7 days, roots were sampled and immediately frozen in liquid nitrogen for further gene expression and protein immunoblotting experiments. Total genomic DNAs were extracted from the plant samples using FastPure™ Plant DNA Isolation Mini Kit (Vazyme, DC104) while RNAs were isolated by FastPure™ Plant RNA Isolation Mini Kit (Vazyme, RC401) according to the manufacturer’s protocol. cDNAs were synthesized from total RNA using the HiScript® II One Step RT-PCR Kit (Vazyme, P611). The DNA and cDNA sequences of six HcHDAC genes were cloned by homology cloning according to the RNA-seq data of kenaf . Gene-specific primers were designed by Primer Premier 5 software and are shown in Additional file 1: Table S1. The PCR amplification was performed in the following configuration: an initial denaturation at 95 °C for 3 min, followed by 35 cycles of denaturation at 95 °C for 15 s, annealing at 56–65 °C for 15 s, 72 °C extension for 1–3 min and final extension at 72 °C for 5 min. All PCR reactions were carried out using 25 μL reaction system; 12.5 μL 2 × Phanta Max Master Mix (Vazyme, China), 1 μL forward primer, 1 μL reverse primer, and 1 μL DNA/cDNA template. PCR products were recycled and then sequenced in BGI (China). Physicochemical property of HcHDACs was predicted by ProtParam tool online (http://web.expasy.org/protparam/). Gene exon–intron structures were analyzed using the Gene Structure Display Server (GSDS2.0, http://gsds.cbi.pku.edu.cn/)  by comparing the codon sequences and genomic sequences of HcHDACs. The conserved domains were predicted with Pfam program (http://pfam.janelia.org/) and HMMER-based SMAT Website (http://smart.embl-heidelberg.de/). The domain architecture was drawn using DOG2.0 software (http://gsds.cbi.pku.edu.cn/). HcHDAC proteins along with proteins from Arabidopsis thaliana, Gossypium arboretum, Oryza sativa Japonica Group, and Solanum lycopersicum downloaded from the National Center for Biotechnology Information (NCBI) databases (https://www.ncbi.nlm.nih.gov/) were aligned with Clustal X . The phylogenetic tree was constructed by the neighbor-joining (NJ) method in MEGA (version 5.0) software . The stability of the internal nodes was assessed by bootstrap analysis of 1000 replicates. A homologous recombination method was used to construct transient expression vectors pBWA(V)HS-HcHDA2-GLosgfp, pBWA(V)HS-HcHDA6-GLosgfp, pBWA(V)HS-HcHDA8-Glosgfp, pBWA(V)HS-HcHDA9-GLosgfp and pBWA(V)HS-HcHDA19-GLosgfp. Tobacco leaf mesophyll protoplasts were isolated from fully expanded leaves of 8-week-old plants . Twenty micrograms of each GFP fusion plasmid was cotransfected into 200 μL protoplasts (4 × 104 protoplasts) using PEG–calcium transfection solution, respectively. Protoplasts were incubated at 25 °C overnight to allow expression of the introduced genes. The GFP fluorescence was examined and photographed using a Leica SP8 confocal fluorescence microscope (Leica, Wetzlar, Germany). qRT-PCR was performed with ChamQ™ SYBR® qPCR Master mix (Vazyme, Q311) using Bio-Rad CFX96 Real-Time PCR Detection System. The gene-specific primers for qRT-PCR were designed by Primer Premier 5 software and are shown in Additional file 1: Table S1. The reaction conditions were as follows: 95 °C for 1 min, followed by 50 cycles of 95 °C for 10 s, and 60 °C for 30 s. The kenaf H3, ACT3 and 18S genes were used as internal controls for normalizing gene expression levels. Each gene contains triplicate for qRT-PCR. The comparative CT value method  was employed to analyze the expression profiles of HcHDACs. Kenaf roots sampled from control, NaCl and drought treated seedlings were ground to power and the histones were extracted according to the manufacturer’s protocol (BB31171, BestBio, Shanghai, China), Around 50 μg histone of each sample was separated by 15% SDS-PAGE gels and transferred to a polyvinylidine fluoride fluoropolymer (PVDF) membrane (0.45 μm, Millipore, Darmstadt, Germany) using Trans-Blot system (Bio-Rad, California, USA). 5% skim milk powder was used to block the membranes in TBST buffer (20 mM Tris–HCl, 150 mM NaCl, 0.05% Tween 20) for 1 h at room temperature. The target protein bands were sequentially detected by Anti-Histone H3 (acetyl K9) Antibody (1:1000 dilution in TBST) (ab12179, abcam, UK), Anti-Histone H3 (acetyl K27) Antibody (1:1000 dilution in TBST) (ab4729, abcam, UK), Anti-Histone H4 (acetyl K5) Antibody (1:50,000 dilution in TBST) (ab51997, abcam, UK) and Anti-Histone H3 Antibody (1:1000 dilution in TBST) (ab1791, abcam, UK). Alkaline Phosphatase Goat anti-Rabbit IgG (H + L) (ZB-2308, CWBIO, Beijing, China) and Alkaline Phosphatase Horse anti-Mouse IgG (H + L) (ZB-2310, CWBIO, Beijing, China) were used as secondary antibodies. Last, an enhanced chemiluminescence (ECL) immunoblotting detection kit (P90719, Millipore, USA) was used for signal detection. The experiments were carried out three times and the Image J software was used to quantify the relative protein levels. Six kenaf histone deacetylases genes, including HcHDA2, HcHDA6, HcHDA8, HcHDA9, HcHDA19 and HcSRT2 were cloned and identified. These HcHDAC genes contained a complete open reading frame (ORF) ranged from 1080 to 1428 bp and their protein length varied from 359 to 475 amino acids (aa). The molecular weights and isoelectric points of these HcHDACs ranged from 39.9 to 62.08 kDa and 5.05 to 9.43, respectively. The GRAVY (grand average of hydropathicity) results indicated that all these HcHDACs were hydrophilic (Table 1). In addition, the DNA and cDNA sequences of these HcHDAC genes were analyzed to confirm the intro-exon organization. The data showed that their conserved coding regions contained various numbers of exons (Table 1 and Fig. 1). 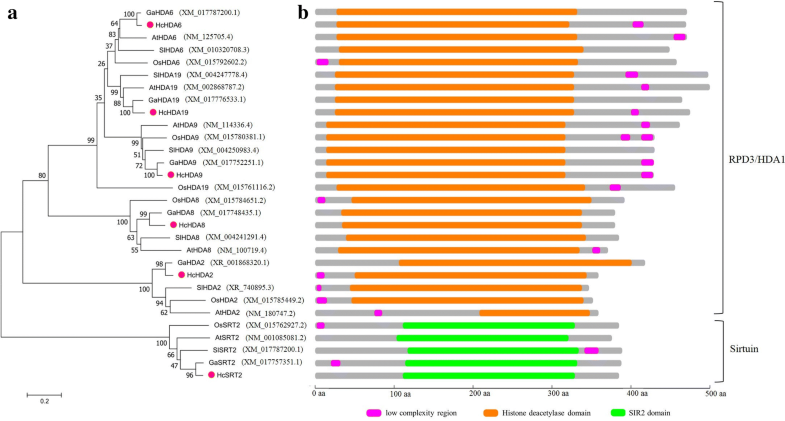 To reveal the evolutionary relationship of histone deacetylases in kenaf, a phylogenetic tree was constructed using histone deacetylases from Arabidopsis thaliana, Gossypium arboreum, Oryza sativa Japonica Group and Solanum lycopersicum. Phylogenetic analysis was performed using MEGA 5.0 software based on the deduced amino acid sequences of these histone deacetylases. The neighbor-joining phylogenetic tree showed that HDACs from kenaf and Gossypium arboreum were at the same clade and showed a strong relationship with high degree of similarity, especially, HcHDA6 and GaHDA6, HcHDA9 and GaHDA9, HcHDA19 and GaHDA19 were grouped together with strong boot-strap support (100%), respectively (Fig. 2a). By analysis of domain architecture, HcHDA2, HcHDA6, HcHDA8, HcHDA9 and HcHDA19 contained a typical deacetylase catalytic domain and belonged to RPD3/HDA1 subfamily, while HcSRT2 contained the conserved domain SIR2 and belonged to Sirtuin subfamily (Fig. 2b). Plant-mPLoc was used to determine the possible localization sites of HcHDACs. Interestingly, HcHDACs were predicted to have different subcellular localizations including nucleus, cytosol and chloroplasts (Table 1), which implied that they might have distinct roles in kenaf. To further determine the subcellular location of HcHDACs, full-length cDNAs were fused to Green Fluorescent Protein (GFP) driven by CaMV 35S promoter and transiently expressed in protoplasts of tobacco suspension culture cells. As shown in Fig. 3, HcHDA2 and HcHDA8 were localized in the nucleus and HcHDA19 was localized in the nucleus and cytosol, which were consistent with the predicted location using bioinformatics program. Whereas, HcHDA9 was localized in both the nucleus and plasma membrane, which was different from the predicted location data. HcHDA6 was not only localized in the nucleus as predicted by Plant-mPLoc programs, but also in the cytosol. The cytosolic localization of HcHDA6 and HcHDA19 suggested that they might play a vital catalytic role on diverse proteins outside the nucleus other than in histone acetylation. Histone deacetylases are essential for plant growth and development. To determine the detail expression patterns of these six HDAC genes in different tissues at various developmental stages of kenaf, real-time qPCR analysis was conducted. Tissue-specific gene expression was normalized to the gene expression levels in the root from seeding stage. All genes detected in the four tissues (root, stem, leaf and anther) are presented in Fig. 4. All the six HcHDAC genes showed high expression levels in leaf at the seedling stage and root at anthesis stage. Except for HcHDA9, which was up-regulated both in root, stem and leaf, the othe five HcHDAC genes were up-regulated in root and stem, but down-regulated in leaf with kenaf development. Among the six HcHDAC genes, HcHDA19 exhibited the greatest expression differences in leaf of seedling and root of anthesis, 200-fold increase was detected compared with control. Flowering is vital for plants to complete the life cycle and reproduce offspring. 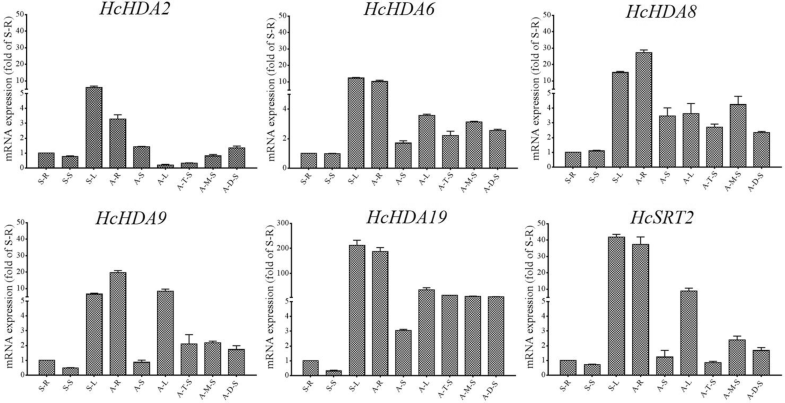 To investigate the expression of these six HcHDAC genes during kenaf anther development, samples from three anther growth stages were used including tetrad (A–T), mononuclear (A–M) and dual-core stage (A–D). Except for HcHDA19, which showed no significant differences during anther development, the other five HcHDAC genes expression changed with anther development. The expression of HcHDA2 increased gradually with anther growth. HcHDA6, HcHDA8, HcHDA9 and HcSRT2 exhibited consistent expression patterns, which were up-regulated at mononuclear stage and then down-regulated at dual-core stage (Fig. 4). Evidence suggests that HDACs participate in various abiotic stress responses in plants. For further study the potential functions of these six HcHDACs under abiotic stress in kenaf, qRT-PCR was used to determine the relative mRNA abundance under salt and drought stress. Salt stress significantly induced the six HcHDAC genes expression (Fig. 5a). Except for HcHDA8, the expression of the other five HcHDAC genes were significantly increased with the increasing concentrations of NaCl, which showed two- to threefold increases under 100 mM and 10- to 15-fold increases under 200 mM NaCl treatment, comparison with control. Substantially changes in the expression of these HcHDAC transcripts were observed in HcHDA9 under 200 mM NaCl treatment, this resulted in 15-fold increase, compared with control. An exposer to drought, the expression patterns of the six HcHDAC genes showed similar trend to salt stress. Except for HcHDA8, the other five HcHDAC genes were strongly induced after PEG treatment (Fig. 5b). In addition, status of H3 and H4 acetylation following NaCl and PEG treatments was analyzed. As shown in Fig. 6, the level of H3K9ac increased under 100 mM NaCl treatment but decreased under 200 mM NaCl treatment. Status of H3K27ac and H4K5ac all decreased after NaCl treatments (Fig. 6a, b). High levels of H3K9ac and low levels of H3K27ac and H4K5ac were observed following 10% PEG treatment. Meanwhile, the level of H3K9ac, H3K27ac and H4K5ac were all down-regulated in response to 20% PEG stress (Fig. 6c, d). A greater number of HDAC genes have been cloned, identified and characterized in various plant species as well the functions of certain HDACs have been investigated [25, 27]. Arabidopsis genome encodes eighteen HDACs [9, 10]. The rice (Oryza sativa L.) genome contains eighteen HDACs [14, 15]. Fifteen HDACs were characterized in tomato (Solanum lycopersicum) . Eleven HDACs were analyzed from litchi (Litchi chinensis Sonn) . HDACs were also identified in maize (Zea mays), poplar (Populus trichocarpa) and banana, each contained fifteen, sixteen and seventeen members, respectively [16, 36, 37]. Compared to the aforementioned plants, hindered by a lack of genomic information, relatively few HDACs were characterized in kenaf. Only six HcHDAC genes were cloned and identified using the molecular biology and bioinformatics analysis in the present study (Table 1), the other HcHDAC genes in kenaf need to be identified and characterized in the future study. In Arabidopsis, HDA8 was reported to localize in the cytosol , while HDA6 and HDA19 in the nucleus [23, 39, 40]. In the present study, we found that HcHDA8 was localized in the nucleus, which was different from AtHDA8. HcHDA6 and HcHDA19 were not only localized in the nucleus but also in the cytosol, suggesting a possible shuttling process between the cytoplasm and the nucleus (Fig. 3). It should be noted, however, that the subcellular localization assays in the present study were performed using tobacco cells, and therefore, the localization pattern in situ could be influenced by kenaf-specific interactions. The expression of the six HcHDAC genes was detectable in roots, stems, leaves and anthers (Fig. 4). The different expression pattern of these HcHDAC genes may imply different functions in growth and development of kenaf. However, the further research on specific roles of these genes in kenaf was necessary. Flowering is vital for plants to complete the life cycle and reproduce offspring. Flower growth and development is a tightly and exclusively regulated process and a number of histone acetylation factors have been identified to be associated with flower organ formation and flowering time control [27, 41]. In Arabidopsis, there were a variety of flower developmental aberrations observed in the loss-of-function AtHDA19 line, including reduced female fertility, smaller siliques and abnormal flowers [39, 42, 43]. The dysfunction of AtGCN5 caused short stamens and petals, and defects in floral organ identity . MCC1 over-expression mutant led to meiotic defects resulting in abortion in about half of the male and female gametes due to histone hyperacetylation . HAM1 and HAM2 played important roles in gametogenesis redundantly by genetic and cytological analysis . In this work, the expression of five HcHDAC genes, including HcHDA2, HcHDA6, HcHDA8, HcHDA9 and HcSRT2 changed with anther development. A possible function of these HcHDACs involved in kenaf anther growth was suggested. Kenaf can be used in the phytoremediation of salt contaminated soil and as a drought tolerant crop. Though researches on kenaf salt and drought tolerance have made some progresses [46–52], the mechanisms of salt and drought tolerance are still unclear. Histone acetylation is an important epigenetic modification, which regulates gene activity in response to stress. Till now, there is no reports addressing histone acetylation modification in kenaf. Therefore, it is necessary to explore the mechanism of salinity and drought tolerance from the aspect of histone acetylation modification. Researches showed histone acetylation was involved in plant responses to salt and drought stresses . In Arabidopsis, the expression levels of histone deacetylases HD2A, HD2B, HD2C and HD2D were suppressed by high salt treatment . The overexpression of HD2C and HD2D showed enhanced tolerance to drought and salt [55, 56]. HDA6 was associated with HDT3/HD2C regulated gene expression in response to salt stress and also involved in drought stress tolerance by regulating gene expression in acetate biosynthesis pathway [57, 58]. SlHDACs were induced in various degrees under high salinity and dehydration in tomato (Solanum lycopersicum) . To understand whether and how kenaf responses to environmental stress by epigenetics, the expression of HcHDACs following treatments with NaCl and PEG solution was analyzed in our study. qRT-PCR results showed that these six HcHDAC genes were all dramatically induced in various degrees under salt and drought treatments (Fig. 5a, b), indicating that these HcHDAC genes were involved in the epigenetic regulation of salt and drought resistance genes. Furthermore, we showed that NaCl and PEG treatments can influence the levels of histone H3 and H4 acetylation, indicating that histone acetylation may play a key role in the response to both NaCl and PEG stress. One or more of the HcHDAC genes may hold promise for improving stress tolerance in kenaf via genetic engineering. The knowledge about HcHDACs in salt and drought responses will contribute to further understanding of molecular mechanisms that control salt and drought stress responses, and how HDACs function in this process. We hoped that this would eventually lead to a better understanding of how plants adapt to environmental changes and a long-term improvement of salt and drought stress tolerance. Histone acetylation and deacetylation, which are regulated by histone acetyltransferases (HATs) and histone deacetylases (HDACs), are key players in the modification of chromatin structure and regulation of gene expression. However, data regarding HDACs in kenaf crop has not been disclosed yet. In the present study, we isolated and characterized six HDACs genes from kenaf. Phylogenetic tree revealed that HcHDACs shared high degree of sequence homology with those of Gossypium arboreum. 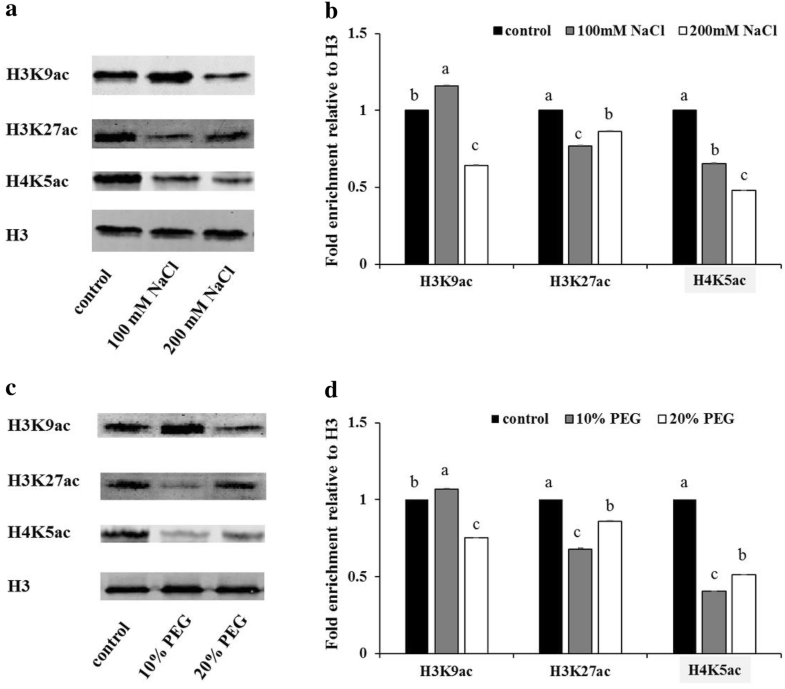 Transient expression of tobacco protoplasts showed that HcHDA2 and HcHDA8 were localized in the nucleus, HcHDA6 and HcHDA19 in nucleus and cytosol, while HcHDA9 in nucleus and plasma membranes. Six HcHDACs genes were expressed with distinct expression patterns in different tissues examined and all of them were salt and drought stress-responsive. Furthermore, our data showed that histone acetylation levels were affected under salt and drought stress treatment. It is suggested that HDACs are imperative players for growth and development as well stress responses in kenaf. Further studies are required to confirm the functions of these genes as well as to explore the mechanisms that underlie responses to salt and drought stress in kenaf. PC conceived this study and revised the manuscript. FW performed the experiments and drafted the manuscript. DT contributed to data interpretation and preparation of the manuscript. ZL and RJ contributed to materials management. AK and MHK provided suggestion for the manuscript. HL contributed to the collection of samples. All authors read and approved the final manuscript. Authors are thankful for the financial support from the National Natural Science Foundation of China (31560341) and the earmarked fund for Modern Agro-industry Technology Research System (CARS-16-E14), and Prof. Ruiyang Zhou for providing seeds of kenaf cultivar P3B. All data analyzed during this study are included in this article. We are thankful to the National Natural Science Foundation of China and the earmarked fund for Modern Agro-industry Technology Research System for their financial support. 40659_2019_227_MOESM1_ESM.docx Additional file 1: Table S1. Description of primers used in the study.